Wood moisture meter HIT-5 is an electronic device for measuring moisture contents in wood. The design of the device enables using long needles and measurements of moisture contents of large pieces of wood. The electrodes are inserted into and taken out of the wood using a swingle. Therefore the needles are always perpendicular to the surface and do not get bend or broken. Whole device is made of chromium steel. Electronic circuit board is well protected with shock absorbent materials. 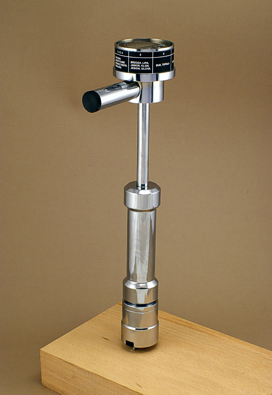 Moisture meter HIT-5 can be used for measurements of moisture contents of 270 different wood types. It is equipped with wood type and temperature compensation circuits. Moisture meter HIT-5 is designed for wood industry, forestry and other industries utilizing wood. 6 % - 60 % abs. moisture cont. Moisture meter HIT-5 replaces a previous model HIT-4. HIT-5 has an improved mechanical design making it even more robust and durable. Gold Medal Award at the International Trade Fair of Machines and Tools for Woodworking and Furniture Industries, DREMA 2018, Poznań.